You are here: Home / Events / My bag is YOURS! / Reward yourself… for a great cause! 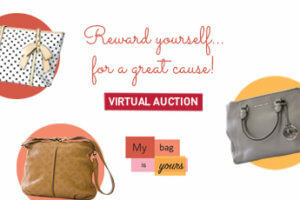 The virtual auction My bag is YOURS!, benefitting Montreal’s girls and women begins today! It’s a go! The Women’s Y Foundation launches the My bag is YOURS! virtual auction. Hurry, you may find the handbag of your dreams, be it designer, colourful, small, big, funky or classical! You can find them on the auction site, online as of now, until June 3rd. All profits will go to the Women’s Y Foundation to support programs and services of the YWCA Montreal. By purchasing a handbag, you concretely support the YWCA Montreal goals to fight against violence towards women, cyberbullying, bullying and sexual exploitation. The YWCA also generates long term changes fostering the integration of women to the labor market, eliminating inequities and breaking isolation. Let’s get together to build a better future for girls and women! The entrepreneur Déborah Cherenfant and media personalities Zeeta Maharaj and Carole St-Denis, enthusiastically joined the campaign, as the Campaign’s spokespeople. They have been involved and joining forces for a number of weeks and will continue to be! A network of ambassadors from the business world, as well as the public at large, further supported the campaign by gathering more than 450 handbags… sincere thanks to all of you! More than 160 of those handbags are available for purchase on the auction site right now. All the other bags will be sold at Fringues thrift-boutique, the workplace internship for the participants of Fringues & Cie, a reintegration program at YWCA Montreal. The My bag is YOURS campaign will conclude on June 15, 2017 during the My bag is YOURS! happening. Handbags purchased during the auction can be picked up during this festive cocktail taking place at Complexe Desjardins. Visit our virtual auction My bag is YOURS, which will be online from May 18th to June 3rd 2017.